The Collins View Neighborhood and the River View Cemetery on the west and north. The RVNA Management Plan is on the Parks and Recreation website [RVNAMP]. 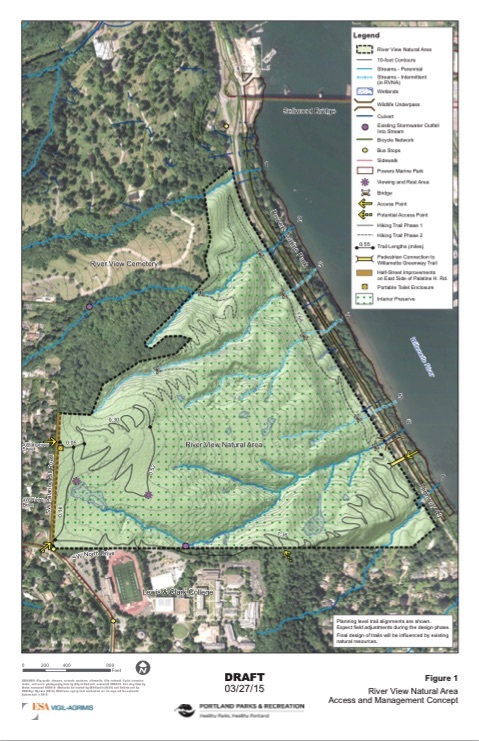 Here is a map of the proposed management plan for the natural area. Click to see full page image. There currently are no approved trails on the ground in RVNA. 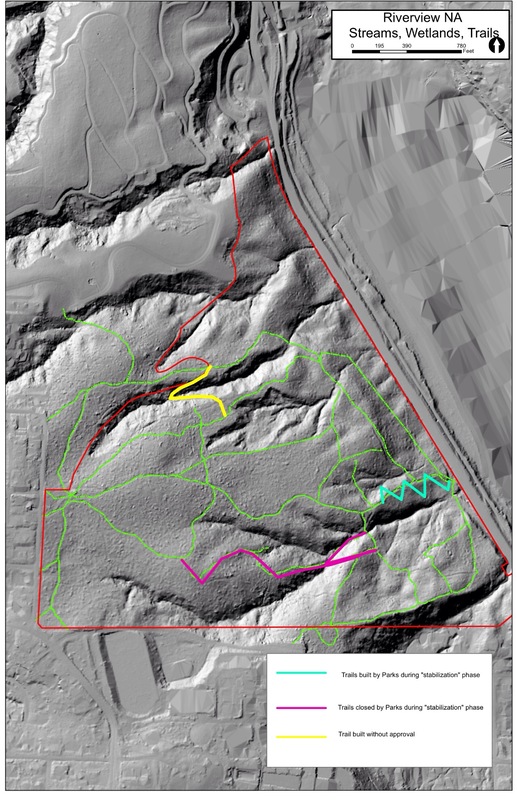 The new trail is only designed technically, not plotted on the ground. 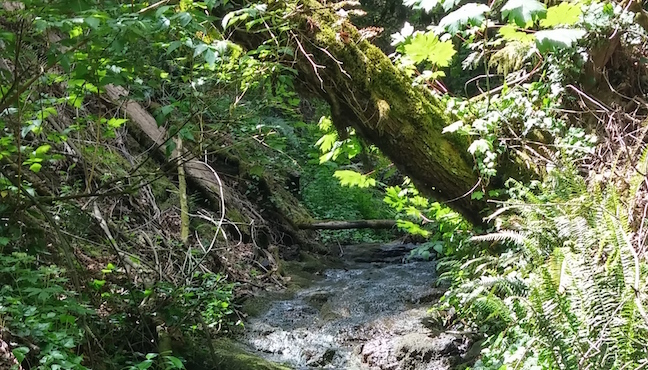 As of May 2015 there is no budget for RVNA, ergo no park rangers to enforce the 3/16/2015 Mountain Bike prohibition, nor funds to decommission 'social' trails, and so on. an 'Interior Forest Habitat', with a big Loop trail around the perimeter. very limited access to the interior, for scientific studies. a smaller loop in the flatter west end of the natural area. 35 parking spaces along Palatine Hill Road. No parking lot per se. No parking on Hwy 43.
a potential future connection (crossing Hwy 43) to Powers Marine Park. Respect Wildlife and vegetation. Don't pick flowers. Pedestrian Trails Only. Stay on Trails. Pack out what you take in. Leave No Trash. Management Plan Map. (Future). Larger view of map above. [LINK]. RVNA Working Map - use at own risk! [PDF]. Recommend Figure 8 Loop Hike. Avoids steep sections. [PDF]. Rogue Bike Trails aka 'Social Trails' Map [LINK]. NW Trails ambitious network of MTB trails in RVNA [LINK]. 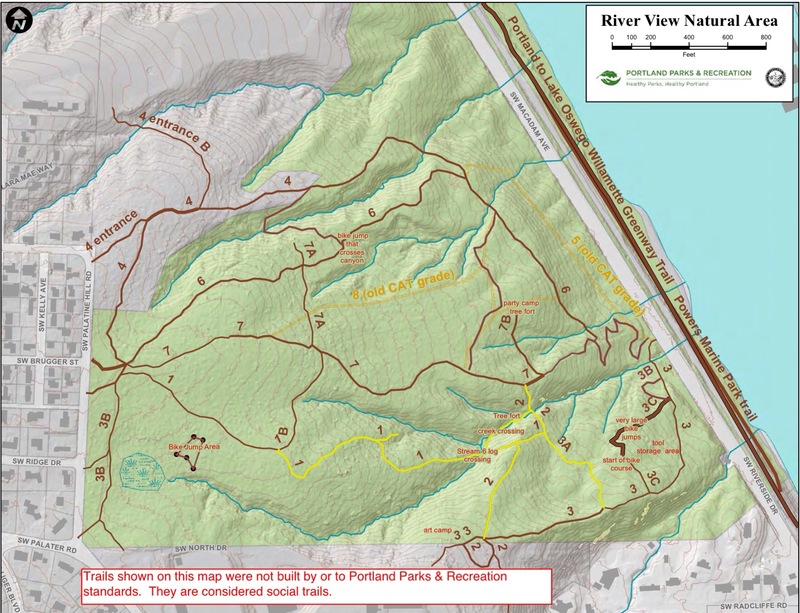 Many maps are on the River View Natural Area page on PP&R web site [LINK]. 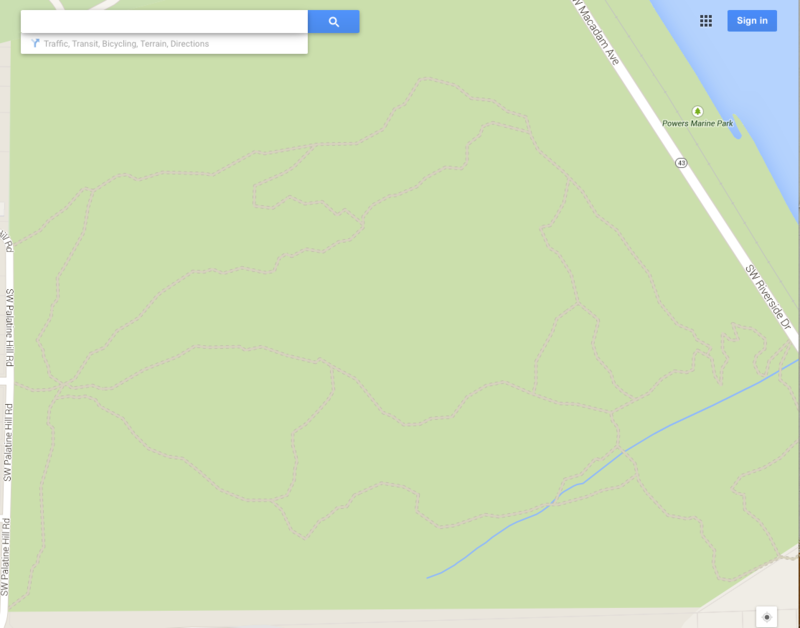 RVNA on Google Maps! (screenshot) [LINK]. Natural Resource Functions, April 2015 [PDF]. Many maps of streams are contained in the Riverview Subwatershed Improvement Strategies Report on BES site? [LINK HERE]. Hiking rules and suggestions. We will provide a reference Map of existing trails for our own purposes. Doggies are no longer allowed in RVNA, on leash or off.